Educating your customers on floral care and handling can help maximize customer satisfaction and increase repeat business. 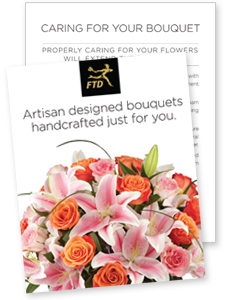 Sending care and handling pic cards with each of your bouquets or hanging a poster in-store informs your customers that several varieties of flowers are delivered in the bud stage to maximize freshness and longevity of their floral products. Creating care and handling pic cards or posters is simple with prepared templates from FTD. Click Here for instructions on how to print the care and handling pic cards and poster.